By Thoriq Firdaus in Hosting. Updated on March 26, 2018 . This is the last part of our series: Install PHP, Apache, and MySQL in Mac without MAMP. And if you have been following the series (see Part 1 and Part 2 here) and have created projects in ~/Sites, then access localhost:8888 in the Browser, you will find that they are displayed as shown in the following screenshot. I’m a bit picky when it comes to user interface of Applications, and the way how Apache server presents the folders intrigues me to customize it, make it look nicer. And this is what we are going to do in this tutorial. If you are ready, let’s just get started. First let’s create a new PHP file named index.php right under the ~/Sites folder. Then, create a folder named assets to store files like the images and CSS that we will be using along with the PHP file, index.php. Open the index.php in code editor, and add a basic HTML5 structure as well as a few additional HTML5 tags, like so. We will put our codes under the div with the .site-body class. First, we need to retrieve several required information from the server, which are the HTTP Host, Current Directory where we put index.php folder, and the list of items that are stored in the current directory. Here are all the codes, make sure that you wrap these with <?php ?>. Then, we put these items in HTML list structure using PHP loop, foreach. 1. if ($folder === '.' or $folder === '..' or $folder === 'assets') continue;. We use this line to exclude the parents directory, which are presented with dots in Apache server. It also excludes the assets that we use to store CSS and images for customizing localhost appearance. For reference, you can head over to the PHP docs about the continue function. 2. The HTML list structure is encapsulated with if (is_dir($cur_dir . '/' . $folder)) conditional function, that way it will only output Folders. Open localhost:8888 in the Browser, and we will get the following result. Before we start writing CSS, let’s download Mac tiny folder icon and Mac OS X folder. Open the files in Photoshop, save the icons in PNG format, and put them inside the /assets/img directory. Then, create a new stylesheet file in the /assets/css directory. Also, include the link in the index.php file. First let’s put the basic styles for the HTML elements. These include setting the box sizing to border-box, so we can easily decide and measure the size of the element. We also set the font-family, and display the HTML list inline. Please note that we omit the browser vendor prefix to make the codes shorter. But we have included it in the source code that you can download at the end of this tutorial. We will mimic the OS X color scheme to make the appearance fit well. So, for the page header, we will give it a gradient with a gray color scheme and put the tiny icon aside. 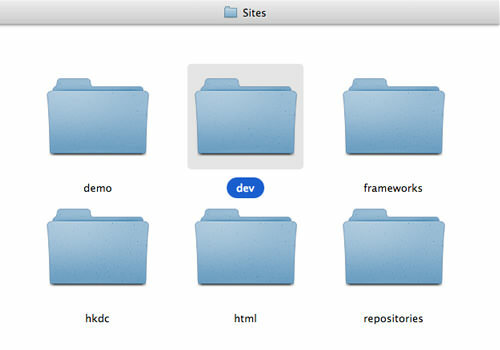 Next, we display the OS X folder on the list items that we have generated with PHP, previously. The following CSS codes also include the styles when we hover the folder. We are done. 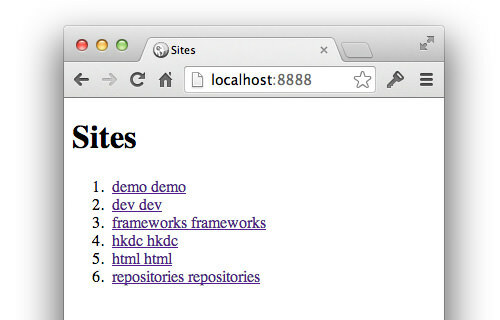 The screenshot below shows the final result when we view localhost:8888 in the browser. In the first part, we have set and configured PHP and Apache. Then, we installed MySQL and manage it with Sequel Pro, in the second part. In this tutorial, which is the last part, we customized the folder presentation in localhost. We hope that you find these tutorials useful. If you have any question regarding to the topic discussed, feel free to put your question in the comment box below.